The story of the invention of the first heavier-than-air, piloted aircraft capable of sustained, controlled flight is so much more than just a story of Yankee know-how and invention. Without college training, the Wright brothers mastered the math and engineering needed to design a completed machine that could fly. There were no engines for aircraft in 1903; they designed and built their own. There were no propellers they could buy; they designed propellers that still have historians shaking their heads. Even after they overcame the considerable hurdles of building an airplane, they still had to learn to fly it, putting their lives on the line every time they went up in the air. 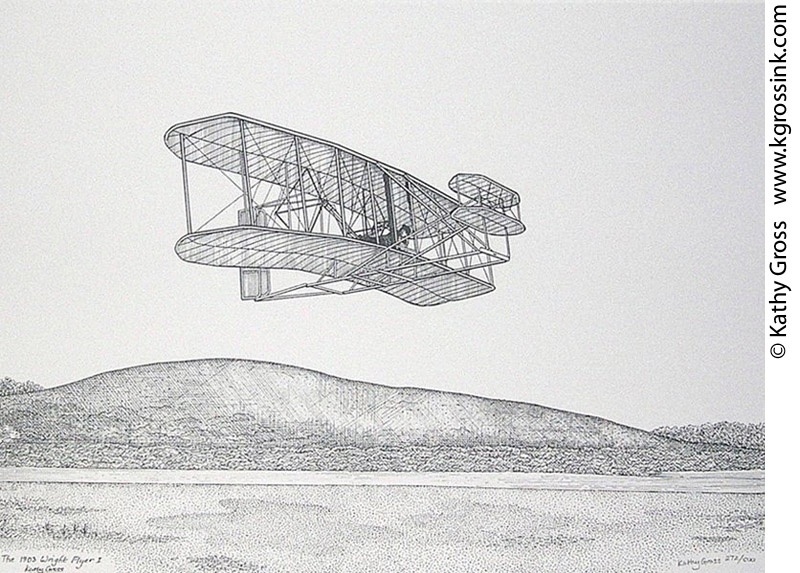 The Wright brothers were the rock stars of their day. Wilbur Wright describes one day in France at the Le Mans auto raceway where the French invited him to test his Flyer. He made his temporary home in a structure close to the racetrack, electing to stay close to his Flyer. People would sneak up to his shelter and peer into his window (even when he was bathing!) to see if he was a real person or some phantom the press invented. One day, Wilbur was aware that over 1,000 people were seated in the bleachers; they had been there for hours. He really hadn’t planned to fly that day, but he didn’t want to disappoint them. He flew for just a few minutes, and the crowd went wild. The French loved him. This sign is on a stand at the National Wright Brothers Memorial at Kill Devil Hills, North Carolina, just a few hundred feet from the original flight path of the first First Flight. Note the text encourages the visitor to go over to the metal sculptures that capture the airplane, Wilbur and Orville, and everyone who witnessed the First Flight exactly where each was at 10:35 that morning. 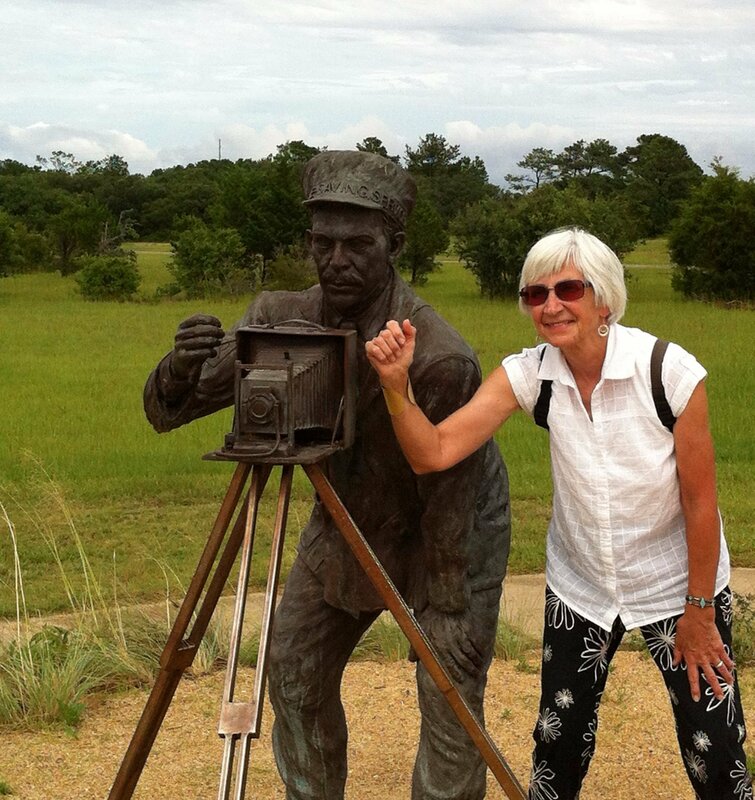 Because of the way the metal statues are arranged at this recapturing of the First Flight scene at 10:35 the morning of December 17, at the National Wright Brothers Memorial at Kill Devil Hills, NC, the park visitor can stand next to John T. Daniels and pretend to take a picture. 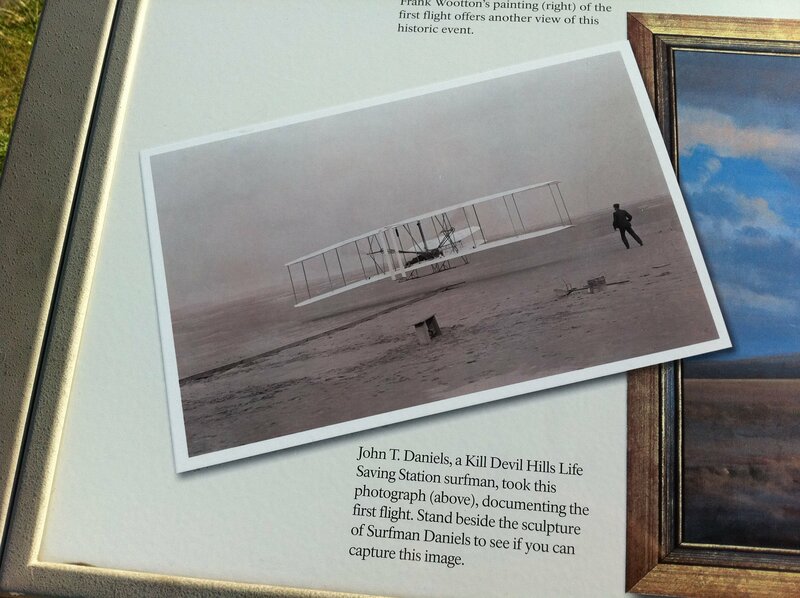 In this photo, Beverly Wright Coleman can “see” exactly what Daniels saw when Orville and the 1903 Flyer left the ground. It’s a little eerie, to tell the truth. This photo, taken at the Manuscripts Division of the Library of Congress (LOC) in October 2011, illustrates two points: (1) The book Orville Wright used to record every flight he made (his flight log) is not much bigger than a credit card. 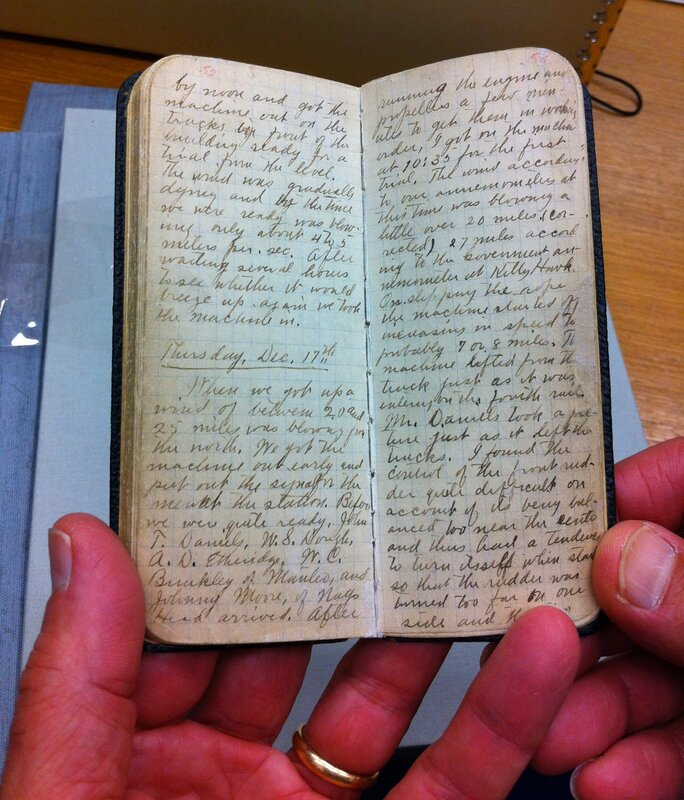 Orville’s handwritten entries in all the Wright journals are tiny and meticulous. 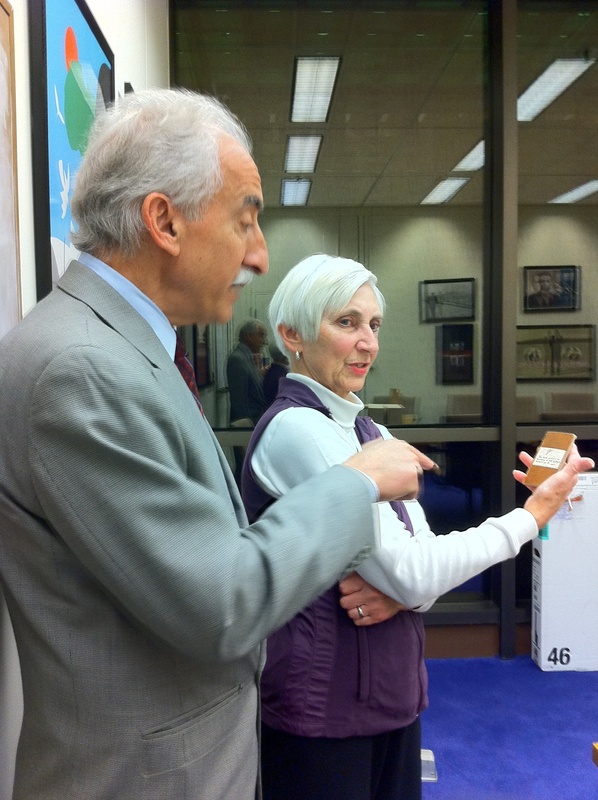 (2) Dr. Leonard Bruno, who was the Director of the Manuscripts Division at the LOC in 2011, is fulfilling his primary function as a librarian—“serving” the public with documents people request. Beverly Wright Coleman was at the LOC to see original source documents and photos. Because these Wright materials are incredibly valuable, Beverly was allowed to view the materials in a conference room with Dr. Bruno. Patrons of the LOC usually request documents to read in the “Reading Room.” The LOC was originally formed to house Thomas Jefferson’s book collection and to help legislators conduct research that would inform their decisions about laws for America.